We are Offsetting our Plastic Footprint! Undivided Food Co. have partnered with Ocean Recovery Alliance, to reduce our plastic footprint. Read all about this fantastic initiative and how you too can get involved in the press release below. Undivided Food Co. are constantly looking for ways that we can make a more positive contribution to the environment and our community. Other great initiatives that we have taken part in can be found via our new Sustainability & Community page. Keeping a light footprint is a core value of Australian whole foods manufacturing business, Undivided Food Co. who have recently partnered with Ocean Recovery Alliance in an effort to reduce their plastic footprint and support environmental sustainability. Undivided Food Co. Co-Founder and Director of Sustainability, Briar Macky says, "whilst we try to use as little plastic as possible in our production process, our plastic pouches allow us to make products that meet consumer requirements in terms of cost, convenience and shelf life. Until there is a better alternative, we believe the healing properties of our broth along with the considered management of our plastic consumption is still a net positive in our ‘undivided’ approach. We are committed to sustainable practices and are therefore taking the necessary steps to ensure our plastic usage is managed in a way that protects our environment”. Plastic Disclosure Project and Plastic Catch are two initiatives created by Ocean Recovery Alliance that provide a means for this. Ocean Recovery Alliance is a non-profit global organisation that creates innovative solutions for companies and communities that help improve our ocean environment. Plastic Disclosure Project is a platform that allows Undivided Food Co. and other businesses to report and measure their baseline use of plastic, how much they recover or recycle, or how much recycled content they use. 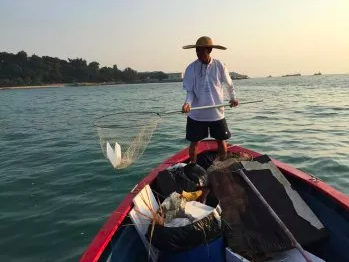 Based on this data, Undivided Food Co. donated the necessary amount of funds to Plastic Catch which supports Asian fishermen to retrieve plastic from the ocean. Not only does this offset their plastic footprint but also provides the fisherman with an alternative source of income. Plastic pollution is currently at the forefront of global environmental issues and one that urgently needs to be addressed given its harmful impact. It’s important that we as a collective educate, encourage and engage in initiatives such as these to reduce the environmental burden of plastic waste. Removal of plastic from the ocean has a positive effect not only on the marine environment but also any food that is harvested. For more information visit www.oceanrecov.org, www.undividedfoodco.com or contact Stephanie Malouf on (+61) 2 9427 2157 or stephanie@undividedfoodco.com. Introducing our New Side Hustle!